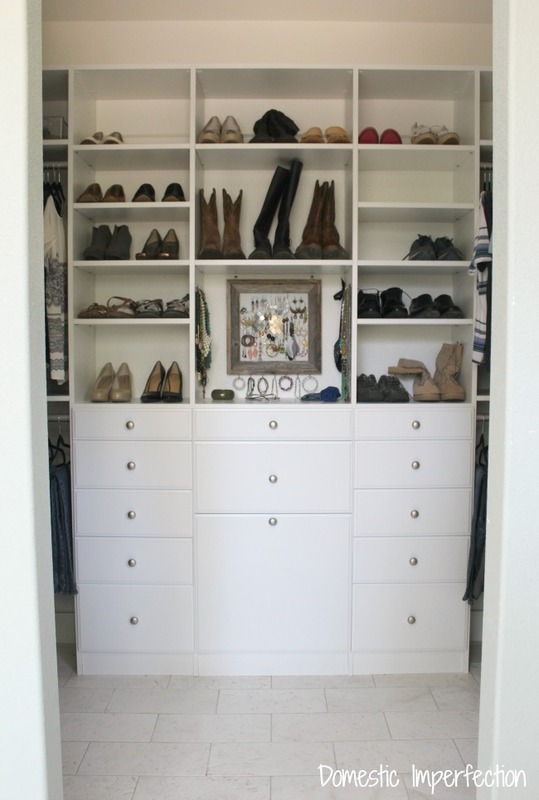 It’s master closet reveal day! I showed y’all the fully installed but empty closet over two months ago, then I had a baby, the holidays came, things got crazy, and the final reveal has been a long time coming. Okay, enough bragging about my housekeeping and mothering skills… let’s get to the tour. 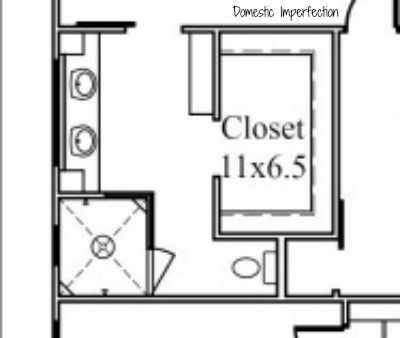 As a reminder, here is the blueprint for the master bathroom and closet. And here is what it looks like these days! The main part of the closet is this center section with shelves for shoes and jewelry, drawers, and even a hidden hamper. Adam and I aren’t going to have any dressers or clothing storage in the bedroom, so everything we own is in this closet (and we even have empty shelves and rods, which is always a good thing). The shoes are all displayed on the shelves and easy to find, and the drawers have plenty of room as well. The drawers also have really smooth soft close drawer slides, which keep them from slamming (I included a video at the end of the post so you can see them in action). Most of my jewelry is out in the open and easy to see, actually organized, and not tangled. 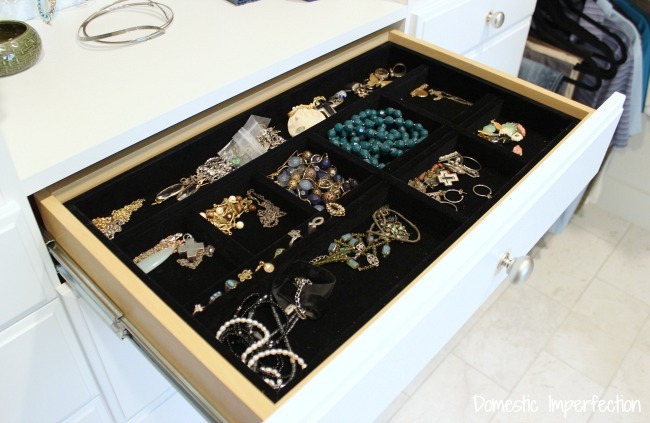 Directly below that is a drawer full of more jewelry, all organized into a velvet lined tray (also from EasyClosets). 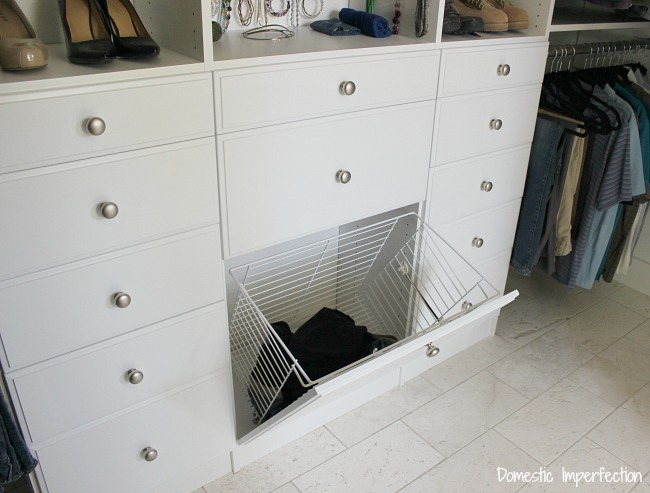 Below that is a built-in laundry hamper, another feature I really love. You can remove the basket to take it to the laundry room…or you can just reach in there, grab everything, and stuff it directly into the washer like I do. To the left is my side of the closet, full of clothes that I am SO HAPPY to finally be wearing again. Nine months (well, actually more like 7 years) of wearing the same old maternity clothes (that were hand me downs or used when I bought them) has gotten a bit old. But now, instead of digging through an old bin of maternity clothes I get to walk into this closet and feel like I’m shopping a little boutique. Everything has a place, and I can see it all, and it stays clean. I even bought all new velvet hangers, because somehow the cheap plastic ones just didn’t feel right in the new closet. Then on the other side is all of Adams things. He has a rod for T-shirts, one for his button up shirts, and one for polos and pants. Then there is even an empty rod which I’m sure we will fill up eventually, but for now it just holds extra hangers. 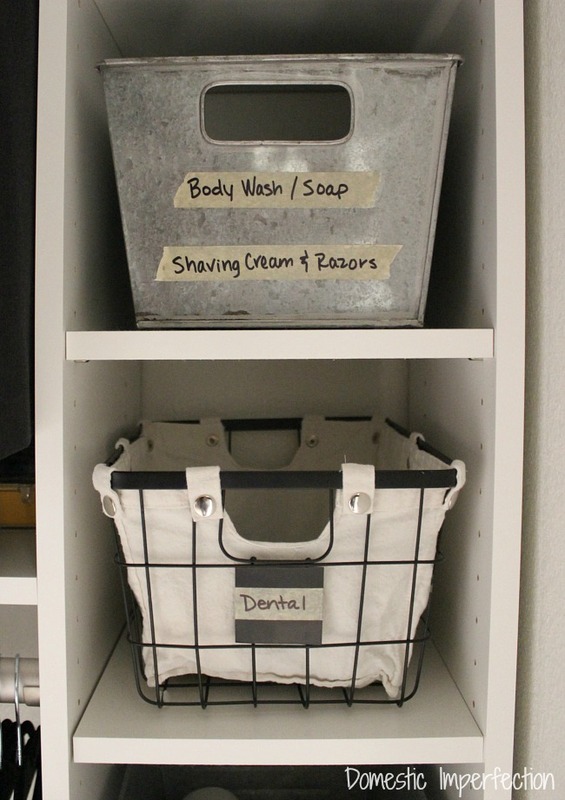 To the right of that you will see a bunch of baskets on shelves…this is basically our bathroom closet. We didn’t put a closet into our master bathroom because there just wasn’t space for it in the plans, so I added these instead. I coupon and buy things in bulk when they are a great price, and since personal hygiene stuff is usually the easiest to find deals on (plus they don’t really expire) I always have extras lying around. So I grabbed some baskets that I already had, labeled them with tape and a sharpie, and now have plenty of storage. Between these shelves and storage in the (future) bathroom vanity I don’t think we will miss having a closet in the bathroom. And that’s the tour! I also made a video version of the tour, so if you want more details (or just want to see me 41 weeks pregnant) then here you go! 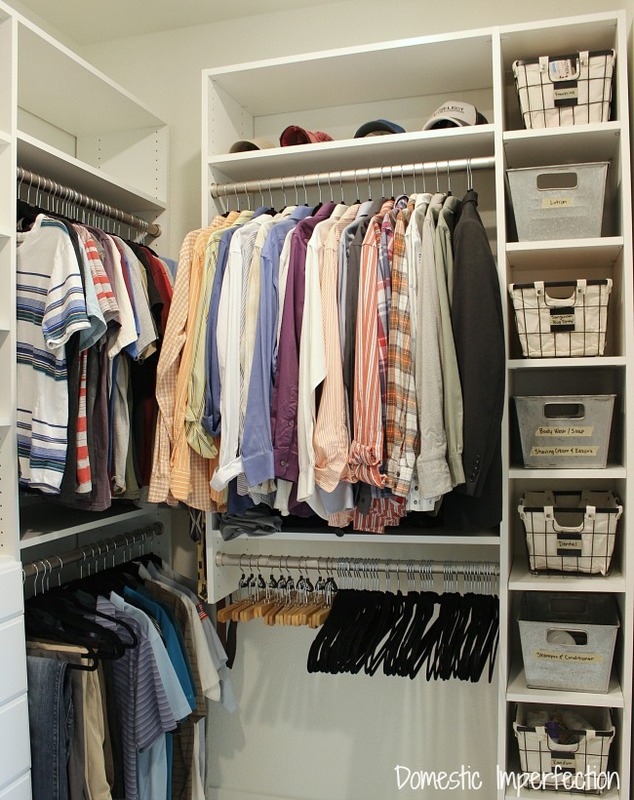 I love Easy Closets! I moved recently and my nice big walk-in closet had only wire shelves. I knew it could be so much better and now it is. I was even able to install the whole system myself! 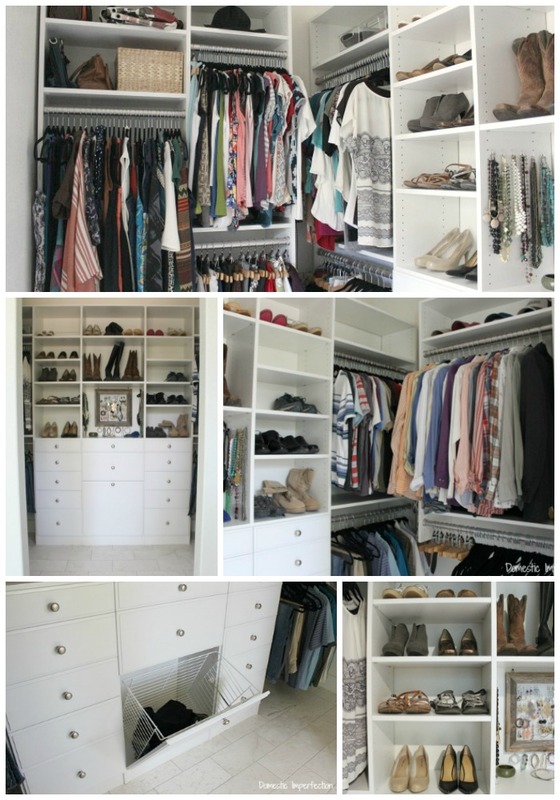 Hopefully I will eventually change all the closets in my home to Easy Closets. Glad to hear it, and nice work on installing it solo! That closet is amazing!! 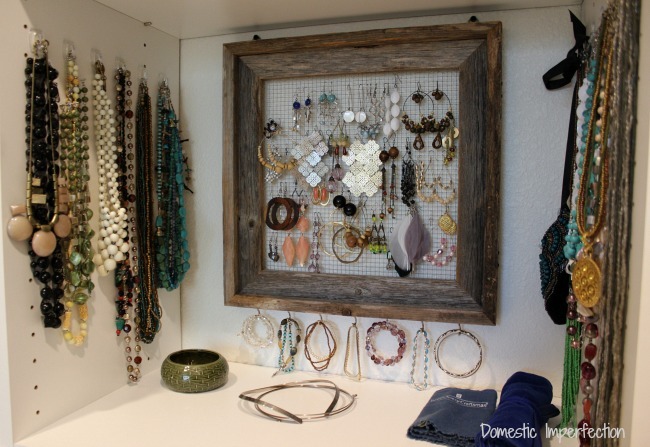 How great to have a functional, pretty, close-able place in your home. 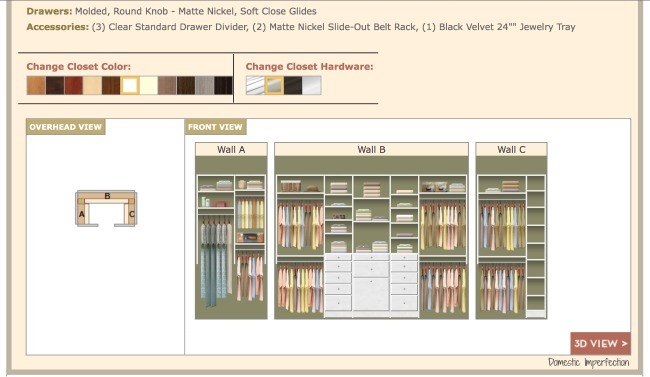 I will definitely keep Easy Closets in mind for when I have a chance to make a closet. Lo-oove the tilt out hamper!! 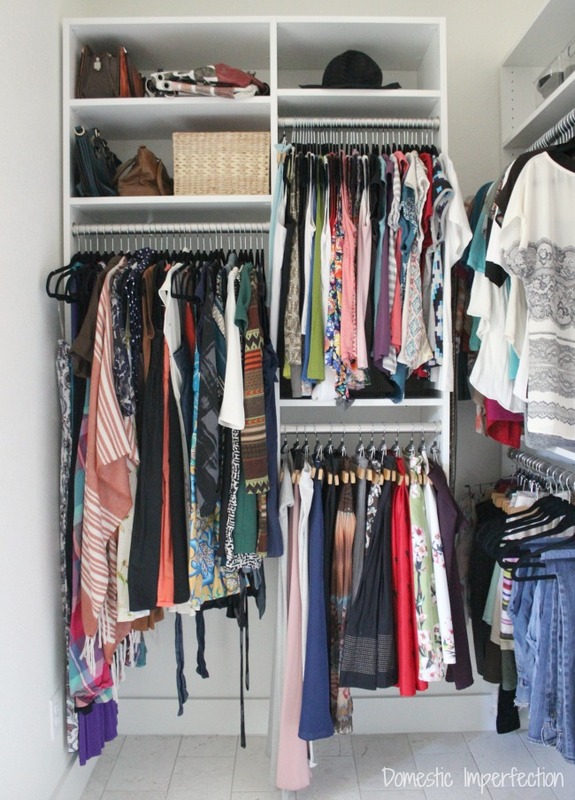 You must hear birds sing every single time you walk into that lovely closet. For some reason I actually love your masking tape and sharpie labels! They honestly really go well with those style of bins and they definitely aren’t trying too hard be be fancy! Your story about the potatoes was so hilarious! I had to share it with my family. Glad the closet and your pregnancy turned out well. Sounds like it’s time to tackle that pantry though. We actually started the pantry today! After we finished the closet it was SO NICE to have a clean organized space in our house that we decided to pick another small space finish it 100% (instead of some of the bigger projects we had been planning). Hopefully we can finish it quickly, because it will take our day-to-day chaos factor down a few notches. Ashley, do you think you were going to get this kind of closet system for the rest of the closets in the house? Yes I do. Not the pantry (my husband is building that as I type) but in the boys room. 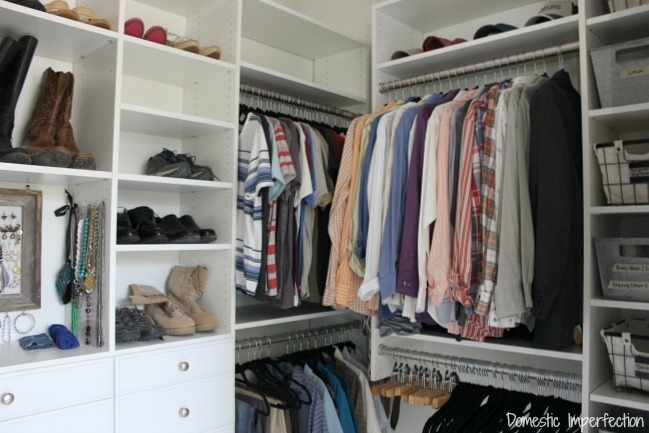 Each room will have two boys sharing one closet, so it will need to be well organized. Right before we moved in we bought a super cheap (like $80) closet “system” for the boys closets that is working for now, but eventually we will need something better. Absolutely beautiful!!! I’m drooling! So fun to see the finished product :-) Nice meeting you too! I love the story of you bribing your kids to find potatoes! 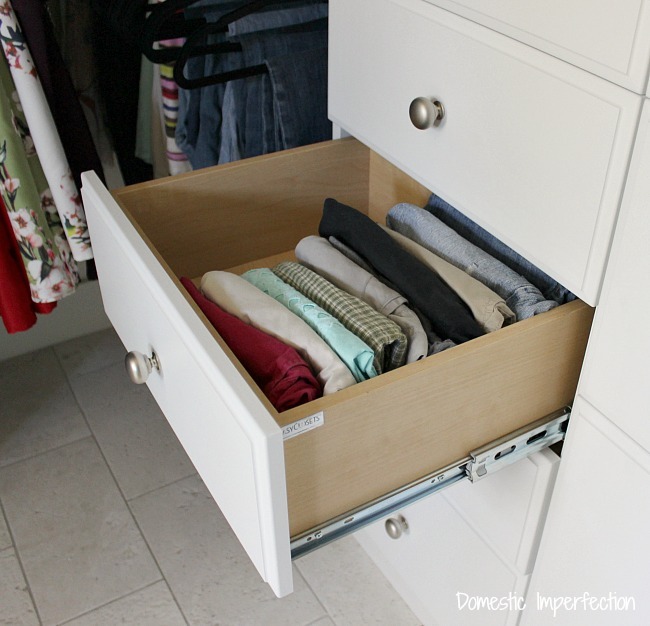 I am also intrigued by the drawer with clothes on their side so you can see them all and not just the top of the stack. 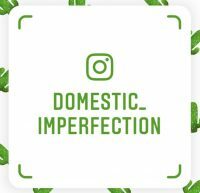 I have to think how I can apply this. I tend to just grab the items on top so wear the same things and not dig down. This could solve that also. The potato story brought back memories! Our daughter used to carry potatoes around the house. I once found one in the washing machine AFTER washing a load of laundry! 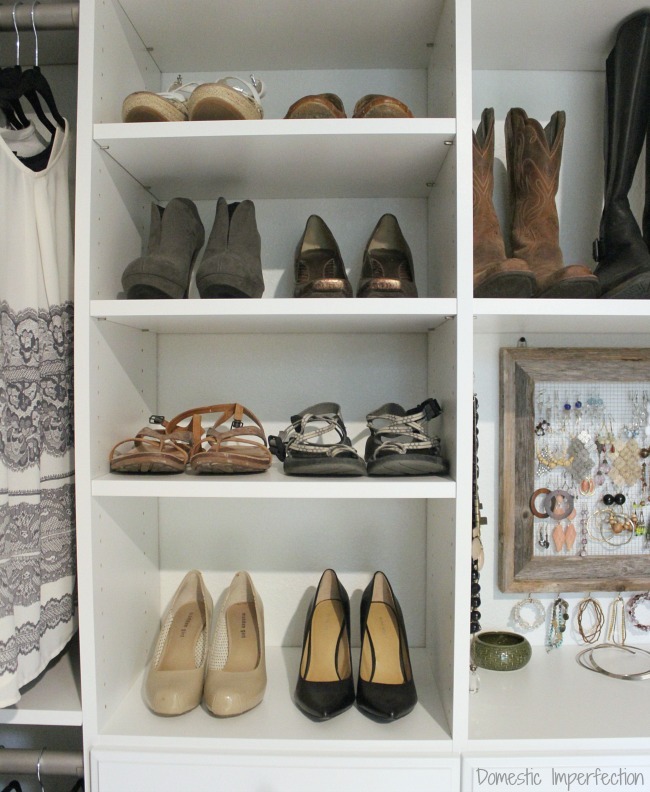 BTW – love the closet! I admire your organization skills Ashley! 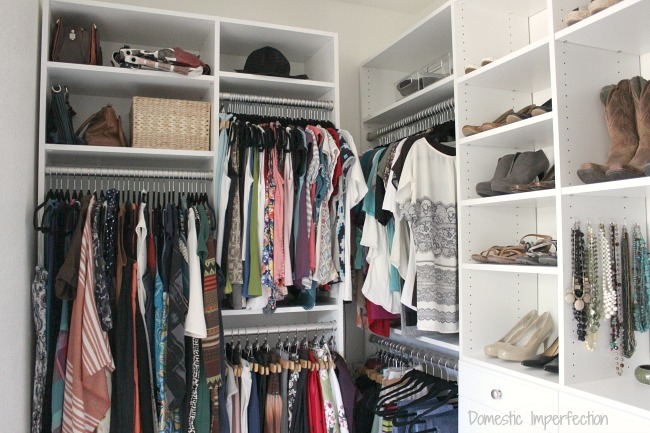 I’ve been having a hard time trying to organize mine, and I like how you threw in the idea of using Easy Closets! I’ll definitely keep these in mind! 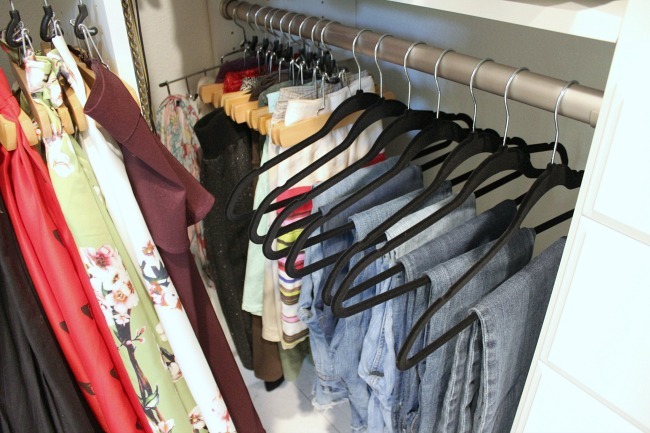 The closet looks amazing! There’s so much space and so many shelves and drawers, I love it! I want a similar one for our bedroom, but I still haven’t made my mind when it comes to how many shelves and drawers I would like. Thanks for sharing! I love the shelves! This is beautiful! Congrats on the new bundle of joy! Quick question, did you join the EasyClosets affiliate program to get in contact with the Partnership team? Looking for guidance on how to get in contact with them. Thanks! 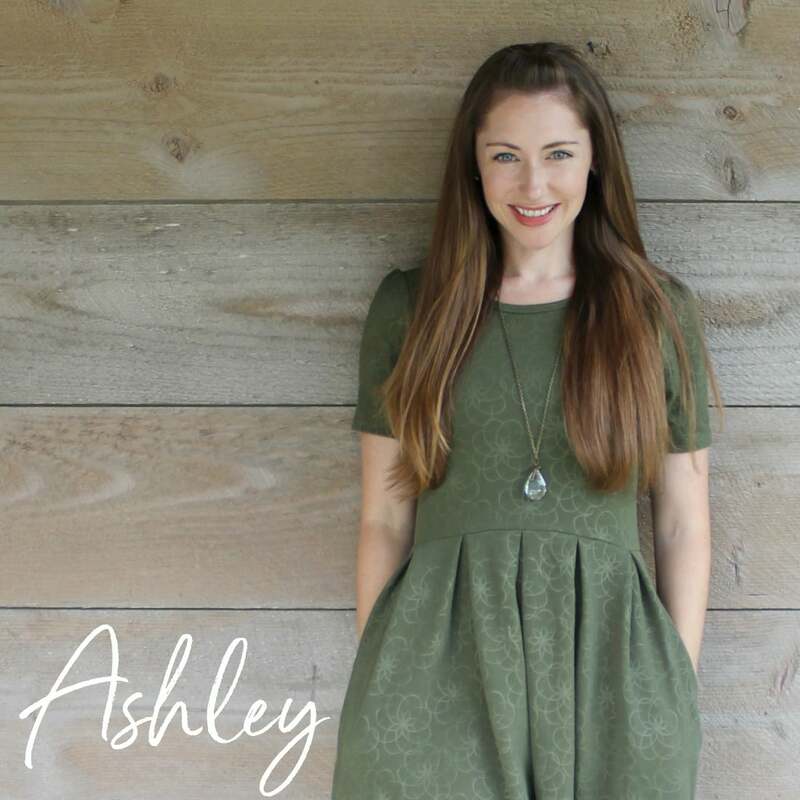 Ashley, this is one of the greatest idea, I am going to make a master closet for my wife, hope she will love it when she came back from her vacation :) BTW your organization skills is epic.